I adored our family of four. We had two happy, silly, lovable boys who were just beginning preschool and kindergarten. Steve and I were starting to feel like real adults, with jobs and kids and a house to take care of. Life was complicated, but beautiful. We each had our own personalities and quirks, which was wonderful, but also complicated. We each had our own needs and wants. David had a disability, which meant he needed to be fed, diapered, and assisted with most activities. Matthias and David had overlapping needs when they were babies and toddlers, but increasingly different needs as they grew. I cherished their uniqueness, but often felt torn trying to meet their differing needs. It seemed like there was always someone who needed my attention. I wanted to give each of my boys — my sons and my husband — what they needed, but that required more time and energy than I had. So I defaulted to my old strategy of setting myself aside. I had been setting my own needs and wants up on a high shelf since I was a girl, and I was good at it. It all started when I stopped fighting for the red bowl. That’s when I first trained myself to stop needing and wanting things. That’s when I bought into the lie that if I could make other people happy, they would love me. In our little family of four, denying my needs and wants meant there was one less complicating factor to manage, one less person to worry about. Plus, I reminded myself that I was doing a good thing by loving and serving others. I felt confident that this would not only make my boys happy but also fill my heart and make me happy. Best of all, if everyone was happy, I would be okay. I would be enough. I would be lovable. Deep down, that’s what I really wanted — to be loved. I made it my twofold mission to love and serve my family and to ignore my own needs and wants. We were creating a meaningful life together. We were making a beautiful home. We ate chocolate chip pancakes on Saturday mornings and read books together at bedtime. We were building a jewelry business that was growing year by year. What had started as a creative hobby at our kitchen table was requiring more of our time and attention — more about this later. Occasionally, Steve and I went out for a date night or enjoyed a rare weekend away. Sometimes I even treated myself to a pedicure. Although we had finally found our way into a new normal, I felt tired and, to be honest, increasingly bitter. I resented that the boys and Steve took and took from me, never considering my needs and wants. There were times I thought they didn’t recognize or appreciate how much I sacrificed for them. In my frustrated moments, I felt like they were ungrateful. These feelings ebbed and flowed. There were also occasional moments when the house was clean and the fridge was full, when the boys were happy and Steve and I felt connected. In those moments, I could exhale. Everything was all right. I was doing a good job. I was a good wife and mom. I was lovable. But those moments were fleeting. Soon the house would be messy again; the fridge would need to be restocked; someone would get upset; Steve and I would disagree. Then I went back to feeling like a failure. Nothing was right. I wasn’t doing a good job. I was a bad wife and mom. I wasn’t lovable. I felt like I had spent my entire life chasing after those brief moments when I could exhale, and now I was tired of chasing. I was tired of feeling like there wasn’t enough space for me. I was tired of feeling like a failure. I was tired of going and going and going. I wanted space. I wanted to rest. I wanted it to be okay to be me; I just didn’t know how. I remember a lesson David taught me on a sunny Sunday morning a couple of years ago. We arrived at church a few minutes early. David held my hand as he slowly climbed the front steps of the church, one at a time. Once inside, he pulled away from me. He wanted to explore the sanctuary before the service began. David was nonverbal, but we were learning that he still had much to say. He communicated by taking our hands and leading us to what he wanted. He spoke through gestures, physical touch, and heart connection. I followed him around the sanctuary as he slid his hand over the smooth wood of the church pews, weaving in and out of the narrow spaces. Then he crossed the aisle and made his way over to a woman sitting by herself. She looked to be in her late thirties, and she had a kind face and a gentle presence. We had never met this woman, but that didn’t stop David from approaching her. He was rarely shy and seemed to have a knack for approaching people who were warm and loving. As he got closer, the woman looked up and smiled at him. Once beside her, David turned around and backed up to her — his way of asking to be held. “No,” she said, “I’d love to hold him.” She carefully lifted him onto her lap. He tenderly wrapped his arms around her neck and laid his head against her shoulder. “Is this okay?” I asked, anxious to be considerate of her. “Would you like me to move him?” She looked up at me with tears in her eyes. I knelt beside them and touched her knee softly as she and David embraced. It was a holy moment of connection that soothed her hurting heart. In that moment, David, who had a disability and was nonverbal, poured out love to a stranger, offering her comfort and connection. I immediately thought about the soul connection I’d had with Trent, the student who had read my mind. I thought about the deep connection I had with Chrissie. I thought about how much I loved David and how our hearts knew each other well. Kneeling beside them, I watched David and his new friend embrace, and I witnessed their souls connecting. I did not have to be good enough. I did not have to be kind enough. I did not have to be perfect. I had nothing to prove. I simply needed to be me. I was already lovable. From this place — just being me, my true self — God does the work of meeting needs. God used David to pour out love on this hurting woman. God had given David a beautiful heart. David didn’t question his worth or value; he simply allowed God to work through him as he was. God had also given me a beautiful heart, the truest part of me. Instead of ignoring my heart, I wanted to listen to it. I wanted to care for my heart and nurture it. In that moment, I was beginning to see that I needed a whole heart so it could overflow with love for others. And I was beginning to wonder if all I needed to do was follow David’s example — to show up and allow the God of the universe to do amazing things through me. Could it be true? If David was just being himself, could I just be me — the me God made me to be, my truest self? I wanted to believe it; I was beginning to believe it. That day, I took my first steps on a new path — a path toward being my truest self. I did not know it yet, but this path would get much rockier before it got smooth again. It would not be easy to become a whole person who could acknowledge her needs and wants. It would not be easy to let go of my desire to please others and make them happy. I would walk through dark times before I could see the light. But God had given me a glimpse of freedom, a peek into what it looked like to just be me. I wanted more space in my life, more beauty in my life, more me in my life. I wanted to become my truest self. Like golden rays when the sky breaks apart Or glue healing the cracks in my heart. Like a long walk together holding hands And barefoot steps along the softest sands. The saltwater wind blowing through my hair. Like hopeful news after weeks of waiting And a melody that’s captivating. Like waking up after a good night’s sleep Or a silent promise we two will keep. Like all in this world that is good and true, Unwrapping a present shiny and new. Like finding hope where least expected, Being safely from the storm protected. Like exhaling and breathing new air, Gazing at something amazing and rare. Like what was broken has been made whole, It’s a peek into your beautiful soul. Like a sigh of relief, peace in knowing We’ll be together, wherever we’re going. Like two hearts each other befriending And a story with a happy ending. Your smile is magic, simple and pure. I’ve seen it firsthand, so I know for sure. 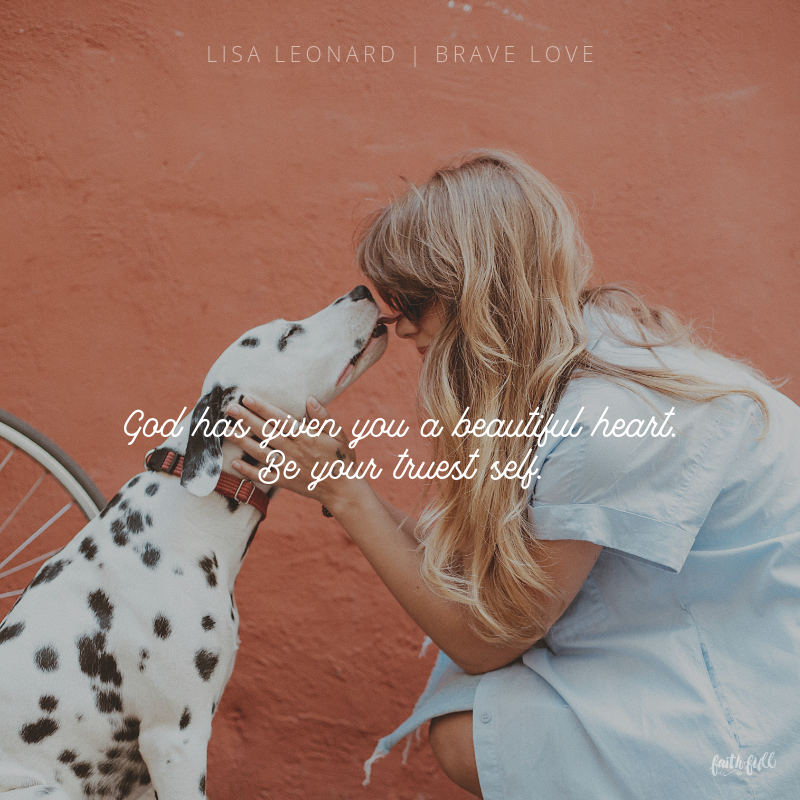 Excerpted with permission from Brave Love by Lisa Leonard, copyright Lisa Leonard.